Cause bracelets work well for mounting a flashlight on handlebars. I don’t know about you, but today’s LED flashlights seem to offer more bang for the buck than dedicated bike lights. I will delve into that further when I review the EagleTac D25LC2. I test-rode it on city streets for a 7-mile ride and there was no movement. It’s easy to attach and remove, although those with weak hands may have difficulty. I use tapered Ritchey bars that expand to 32 mm near the stem. You’ll want to wrap some grippy material around the bar where the flashlight is mounted. In my case I used some ancient Cycle Pro cloth handlebar tape. I would not suggest using NOS Cycle Pro tape, which will cost you a wallet-piercing $28 or so off eBay. Other clever mounting methods include using tee PVC pipe or hose clamps, but they have their drawbacks and look dorky. 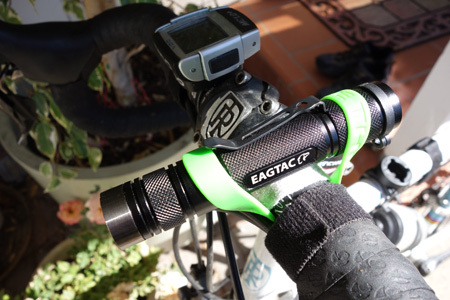 You can also buy flashlight mounts designed for bikes, some which look like they would work well, such as the velcro mount. This entry was posted on August 24, 2013 at 12:09 pm and is filed under Products. You can follow any responses to this entry through the RSS 2.0 feed. You can leave a response, or trackback from your own site.